Since 18 89, quality and reliability have been a tradition at Ruud.The tradition continues today as we introduce innovative products for our customers around the world. 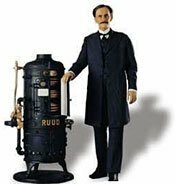 A 100-Year Tradition of Reliability More than 100 years ago, Edwin Ruud, a Norwegian mechanical engineer, came to America and developed the first successful automatic water heater. That early success marked the beginning of a tradition of innovation and value that led to the introduction of RUUD heating and air conditioning equipment in the 1950s. Since then, the RUUD Air Conditioning Division has grown into one of North America’s largest manufacturers of quality cooling and heating products for residential and light commercial use.